A drill team is a group of dancers who perform dance routines in unison. Drill teams, also called dance squads, usually belong to high schools or colleges and perform at games and other school-related events. Some drill teams compete against other teams at competitions. While cheerleaders may dance, drill teams typically don't cheer. Cheerleading may be more athletic, involving stunts and certain jumps. Cheer and drill are not the same. Dance drill teams typically have a routine set to music, whether live or pre-recorded. Here's a bit more about drill teams. The first drill team was created by Gussie Nell Davis in at Greenville High School in Greenville, Texas. Known as the Flaming Flashes, the drill team performed during every halftime show at the school. 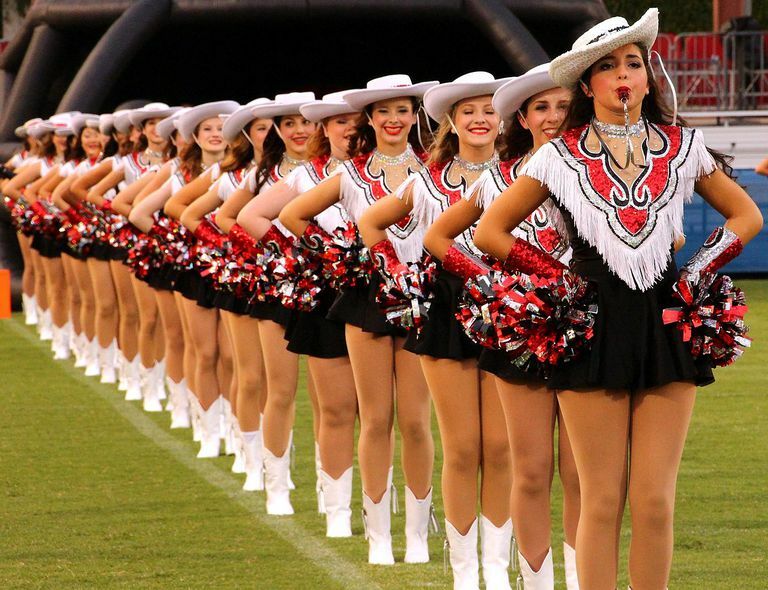 Davis then created a college drill team in Kilgore, Texas, the well-known Kilgore Rangerettes. The American Dance/Drill Team was founded in 1958 by Davis and Irving Dreibrodt to provide a medium for professional instruction for dance and drill teams around the United States. The company presents training camps, contests, and clinics to teams of dancers. A dance squad associated with a school is not the only kind of drill team. Military drill teams are actually not dancers, but they do perform synchronized routines. A military drill team is marching unit that performed specific military drills, either armed or not. These drills are often not performed to music. Branches of the U.S. military have official drill teams as part of their honor guard. Other drill teams may carry flags or pompoms or may do gymnastics. The color guard is considered a type of drill team. You can also find drill teams on horses, motorcycles, carts or with other props, such as chairs or dogs. In parades, you may see funny lawn chair drill teams that do coordinated routines that involve tricks with their lawn chairs. What Are Some Surprising Facts About Cheerleading History?